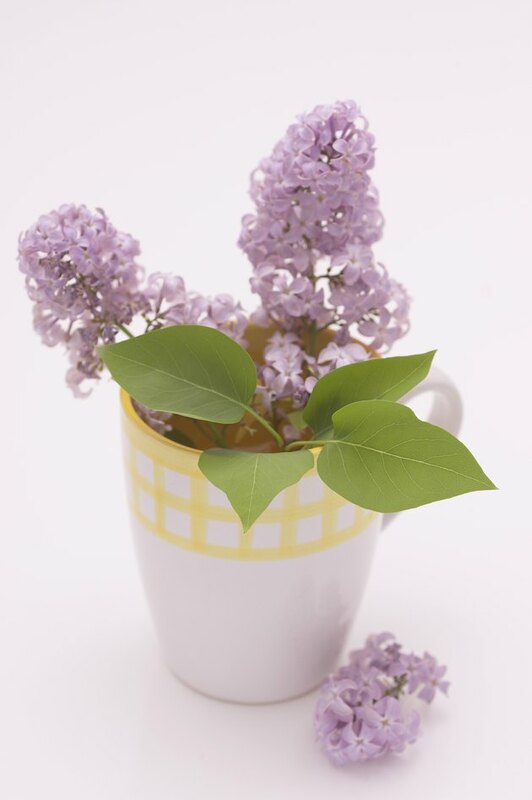 Most people think of common lilacs (Syringa vulgaris) when they consider lilac fragrance, but the scent varies, depending on the lilac variety -- from heady and sweet to spicy and intense. Lilac season is fleeting, lasting only three or four weeks. Cut some lilac stems and bring them indoors to enjoy the fragrance while it lasts. Place cut lilac stems in cold water for long-lasting blooms. Common lilacs have a strong, sweet, heady scent that is almost cloying. When placed indoors, the fragrance of cut lilacs quickly permeates a room. Most people find the fragrance of lilacs appealing, although a few find it too sweet. The fragrance of lilacs may vary, depending on the time of day as well as stage of bloom. The most intense fragrance is usually apparent on warm, sunny days. Korean lilac (Syringa patula) has smaller flowers than common lilac and the flowers are densely formed. Their scent is intense and slightly spicy, with less sweetness than common lilacs. Japanese tree lilac (S. reticulata) grows 30 feet high and produces creamy-white panicles of blooms. The fragrance is completely unlike that of common lilacs, resembling honey. Some people find its fragrance offensive. For best fragrance, plant lilacs in full sun. Apply fertilizer only if the plant shows slow growth or if the soil is very poor. Excessive nitrogen fertilizer reduces flowering, and fewer flowers means less fragrance. Water young lilacs weekly during dry weather. Established plants can tolerate drier conditions. To extend the lilac season, plant several varieties. Try Hyacinthiflora lilacs, such as Bountiful, Churchill or Maiden's Blush for earliest blooms, followed by French hybrids or common lilacs. Korean lilacs, such as Miss Kim, or Preston hybrids, such as Minuet, Pauline and Ursula, bloom later than common lilacs. Japanese tree lilacs bloom early- to mid-summer.